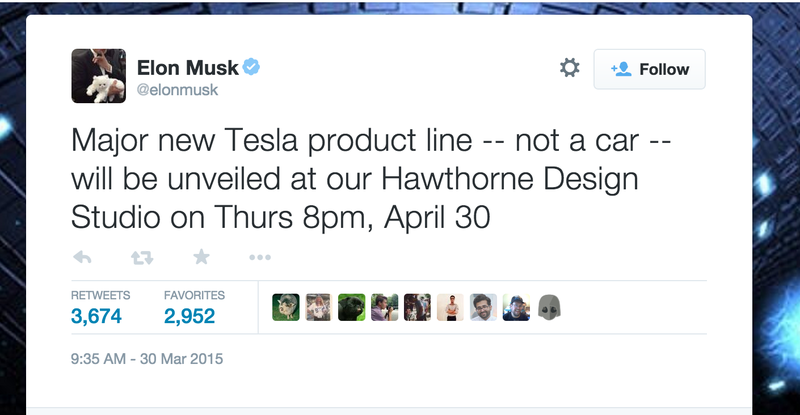 Earlier today, Tesla founder and Twitter tease Elon Musk announced that his company would be unveiling a “Major new product line” on April 3, while cautioning immediately that it’s “not a car.” So what could it be? The biggest bet is something related to Tesla’s batteries. Last month, Musk revealed that Tesla was working on lithium-ion battery packs for home and business use. “We are going to unveil the Tesla home battery, the consumer battery that would be for use in people’s houses or businesses fairly soon,” he told investors at the time. These batteries could possibly be used with things like solar panels to collect and distribute electricity as needed, especially in developing parts of the world or in areas where it’s impractical to run electrical wiring or operate a gas-powered generator. So far, aside from the fact that this new product line is not a car, the company isn’t giving any additional hints about what will be revealed on April 30.